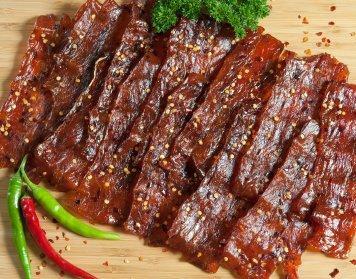 Jerky is popular for camping and backpacking. If you're planning a backpacking trip, whether it is for a few hours or a few days, the right snacks, meals and drinks can make the trip much more pleasant. These backpacking food ideas can help you narrow down the best options for which food to take along based on your dietary needs, favorite foods, cooking options, type of hike, and other factors. No matter how long or short your hike may be, or where you plan to be backpacking, the right food is essential to provide energy so you can stay alert on the trail. Without enough food, a lack of energy can be debilitating and dangerous, even leading to illness or injury. A prepared backpacker will plan to take along snacks, meals, and drinks, though the type and quantity of the food will vary for every hiker's needs and preferences. Choose several different types of snacks to pack along on a hike so you can satisfy different tastes. Different treats will also give you more motivation to complete harder sections of the hike and will help you refuel adequately for the journey. 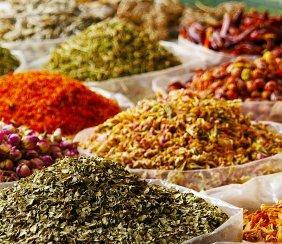 Bring spices to add flavor to meals. For the first night of a longer hike, many experienced backpackers recommend taking a more luxurious meal, one that may be heavy but only needs to be carried for one day. This can be a great reward for accomplishing the first day's hike and helps to vary the diet even more for an extended hike. Fresh meat, vegetables and canned goods can all be perfect for this first meal. In addition to taking along food for meals, don't forget spices and condiments. Small baggies of spices and individual packets of mustard, ketchup, mayonnaise, and relish do not take up much space and do not add much weight to a backpack, but they can add amazing flavor to backpacking meals. Just as you might take along a more extravagant meal for the first night of a long hike, taking along a luxurious drink can be another reward for accomplishing your first day of a backpacking trip. A flask of wine, a bottle of beer, or a can of fresh fruit juice can be a delicious accompaniment to a first meal or snack on your hike. No matter what backpacking food you are considering for your hike, it is important to take note of different factors when planning meals and what to pack. Weight: Every ounce matters when you have to carry all your food, so opt for dried foods that are lighter to carry. Avoid taking too much extra food that would only be extra weight in your pack. Taste: Choose foods that you enjoy and that you will look forward to eating. If you don't like the foods, you are less likely to eat enough for proper energy and nutrition while hiking. Cooking: The longer food takes to cook, the more fuel you will have to carry or gather to prepare each meal. Choose pre-cooked foods that only need reheating, or opt for fast-cooking foods. Spoilage: Avoid taking any foods that will easily spoil so you will not need to also take along a cooler or other way to preserve them. If you do take some foods that can spoil, plan to eat them first. Allergies: If you will be hiking with several people, consider their dietary needs and allergies when planning meals. This will help all of you plan more elaborate meals without problems. Nutrition: Choose foods from all food groups to include with every meal, and strive for a balanced, healthy diet. If necessary, add vitamin supplements to your backpacking diet. Don't skimp on eating. Backpacking and hiking uses up a lot of energy, and you will burn off extra calories quickly. Try new foods at home before you go backpacking so you will know how to cook them properly and you will be familiar with how they taste. Cut up, pre-mix, and pre-cook as much food as possible to save time and trouble on the trail and make homemade backpacking meals easier to prepare. There are many backpacking food ideas you can consider when planning a hike, whether it is just for a few hours or you will be backpacking for several days. By choosing your snacks, meals, and drinks carefully, they will be not only nutritious but satisfying, and your meals will be an enjoyable part of your backpacking trip.